Lot of people load up on carbs the night before a marathon, but what do people do after they have run one? Some might rest. Some might get a massage. Others might celebrate with a pint! Well at least one runner did. 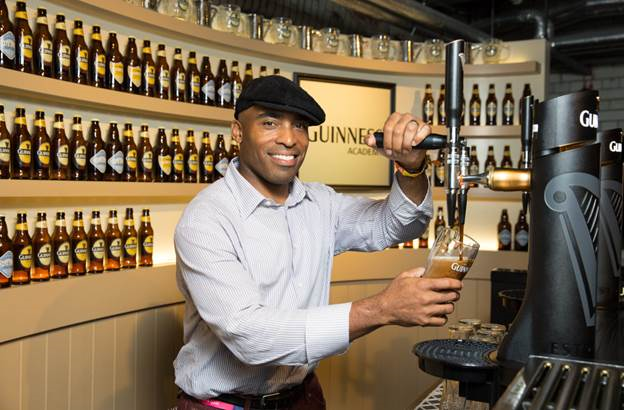 Former professional football player Tiki Barber celebrated finishing the New York City with a flight to Dublin and pour a perfect pint of Guinness. Days after beating last year’s finishing time for the New York City Marathon, Barber traded in his running shoes for a pint glass during a visit to St. James’s Gate which is the Guinness brewery in Dublin, Ireland. While there, Barber tried the newest beer from the brewery, Guinness Nitro IPA, and received a tour of the Guinness brewery and a one-on-one session with the brewery team to learn how to pour the perfect pint of Guinness. Not a bad way of celebrating if you ask me. Guinness St. Patrick’s Day Pledge! Print article This entry was posted by Art Eddy III on November 6, 2015 at 12:30 pm, and is filed under Lifestyle. Follow any responses to this post through RSS 2.0. Both comments and pings are currently closed.